Aqui em casa somos fãs de crumble há anos, por isso já experimentei muitas receitas mas esta do Jamie Olivier bate todas as outras aos pontos! Uma delícia para comer mal sai do forno nos dias mais frios! 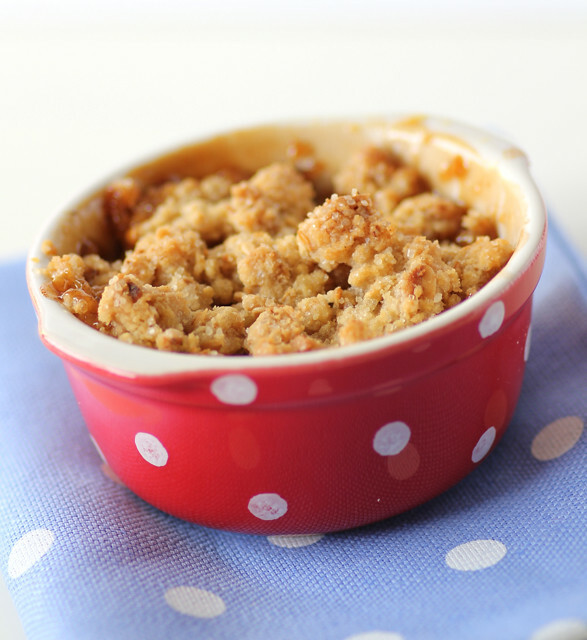 Here at home we’re big fans of crumble, which means I’ve tried many different recipes along the years, but this one from Jamie Oliver is undoubtedly the best one! A delight to eat straight out of the oven in the coldest days! Descascar e tirar os caroços às maçãs e cortar em fatias finas. Numa frigideira anti-aderente colocar a manteiga e os dois tipos de açúcar e cozinhar até o açúcar se dissolver. Juntar as maçãs, a canela e o xarope de árcer e deixar cozinhar em lume brando até as maçãs estarem moles e douradas (cerca de 7 minutos). Colocar as base de maçãs num pirex ou em formas individuais untadas com manteiga. Para a cobertura misturar todos os ingredientes até ficarem com a textura de areia molhada. Peel and cut apples into thin slices. In a non-stick pan place butter and sugar and cook until sugar melts. Add apples and cinnamon and cook over low heat until apples are tender and golden (about 7 minutes). Place the apples in a baking dish greased with butter. For the topping mix all ingredients until they resemble the texture of wet sand. Place the crumble mixture on top of the apples and bake for about 20 minutes. I love caramel and apples together. Bet this is delicious! 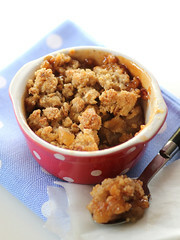 hmm… its been long time i had a apple crumble.. This definitely looks so tempting..
Heavenly! I love the maple syrup. 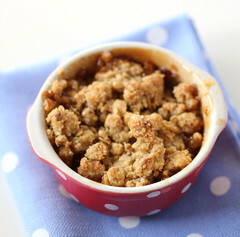 Ja tinha feito variadíssimas receitas de crumble mas esta supera todas.É particularmente deliciosa!!!! Só me faltou a tigela às bolinhas que é mesmo fofinha. This looks so good that I want to go straight to the kitchen and make it! I love baking with demerara sugar and love finding recipes that incorporate it. encontrei o teu blog através das tuas fotos no flickr. gostei muito do teu estilo na cozinha assim como das tuas fotos. Olá! 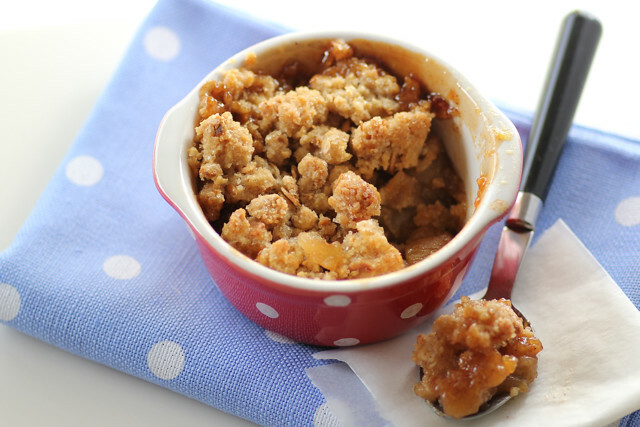 Adoro Crumble de Maçã e essa receita parece ser deliciosa! Pretendo fazer, mas tenho uma dúvida: Qual momento utilizo o Xarope de ácer ou Maple Syrup? Obrigada! Olá Daniella, pode colocar o xarope de acer na mistura de maçãs!